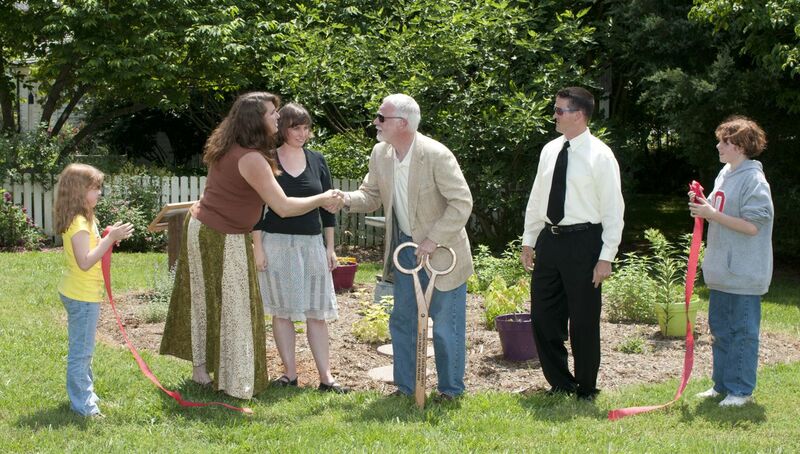 The OCBA Pollinator Garden was dedicated in July 2012. Geneva Green welcomed Hillsborough Mayor Tom Stevens. The Orange County Beekeeper Association’s Pollinator Garden is located in front of the Alexander Dixon House at 150 E. King Street in Hillsborough, N.C. The 20-foot circular garden was created in the fall and winter of 2011 to bring attention to the need for plants for pollinators, especially the honey bee, Apis mellifera. 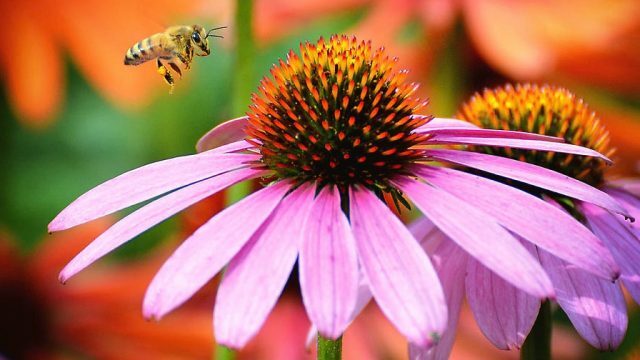 The garden includes salvia, monarda, mountain mint, purple coneflower, catmint, asters, and other flowers preferred by honeybees for pollen and nectar. The goal of the garden is to bring awareness to the Orange County Beekeepers Association and to the plants that will help support honey bees and other local pollinators. Pollinators play an important role in plant reproduction. They collect pollen from the stamen of one flower and deposit it onto the stigma of another, allowing genetic material to be spread and creating variation and adaptability in plants. Besides honey bees, pollinators include hummingbirds, some bats, and numerous other insects, such as native bees, moths, and butterflies. When planting your garden, be sure to include a variety of plants that provide forage for pollinators. Plant a succession of bloom times to maximize forage throughout the year. To protect pollinators, do not use broad spectrum pesticides. If it becomes necessary to treat pests or disease follow the principles of integrated pest management (IPM). IPM allows you to choose treatments less likely to harm bees and other pollinators. And if you do resort to pesticides, apply treatments in the early morning or early evening when honeybees and other insects are less likely to be foraging. For more about specific pollinator plants for North Carolina, visit the website for the Chatham County Pollinator Garden. Maintained by N.C Agricultural Extension Specialist Debbie Roos, it includes lists of pollinator plants and photographs of them in bloom. Another good resource for pollinator plants is the Xerces Society website, which includes information about plants that benefit a wide range of pollinators. The first honey bees, German black bees, were brought to the Americas from Europe during the 1600s. These bees thrived and were carried by homesteaders across the country. Native Americans called honey bees “the white man’s fly” because the bees would arrive at a location a few days before European settlers. By the 1880’s honey bees were thriving as far west as the Mississippi River. When bees outgrew their homes, they swarmed and divided and moved into local woods inhabiting hollow trees. Most people got their bees by locating wild bee trees and cutting them down and bringing them home, creating traditional log hives for them. These log homes often had a hole cut into the side and dowels placed across it to hang comb from. They were called log hives or Bee Gums since Sweet Gum trees were often used. The OCBA pollinator garden includes an example of a log hive. In 1859, Italian honey bees were introduced into this country. They were said to be gentler and better honey producers than the German black bees. They were also supposed to be more resistant to European foulbrood, which was beginning to be a problem. With these new methods for keeping bees, including the introduction of wax foundation and honey extractors, a resurgence of beekeeping occurred. In 1916, the US Department of Agriculture appointed the first beekeeping specialist. In 1917, 150 beekeepers in North Carolina who managed a total of 6,000 bee hives joined together to create the North Carolina State Beekeeper’s Association. The Orange County Beekeepers Association meets every second Thursday of the month at 7:00pm at the Unitarian Universalist Congregation of Hillsborough, 1710 Old NC 10, Hillsborough, NC.